Do as many reps as you can and have your friend help you complete the last rep.
Stop one or two reps before failure and do an extra set with the same weights. Which choice is better for muscle and strength gains? Surprisingly, the second option. In this post, you’ll find out why that is. In research, training to failure is superior for both strength and muscle growth when volume and intensity are matched. For example in a 2005 study by Drinkwater and colleagues two groups of young novice athletes were assigned a volume of 24 reps on the bench press with their 6RM. 6 RM means a weight that they could lift a maximum of 6 reps.
Group A did those 24 reps in 4 sets of 6 taking every set to failure. Group B did those 24 reps in 8 set of 3. They used the same weight as the first group but stopped 3 reps before failure in every set. After 6 weeks, Group A increased strength by an average of 7.3 kg while Group B only by 3.6 kg. When volume and intensity are fixed, training to failure is superior. The reason for that is because by training to failure you inevitably end up doing more effective reps than someone not training to failure with the same volume. This is what happened in the study. The closer the reps are to failure, the more strongly they stimulate adaptation. The last few reps of the 6RM set were the most effective. Of course the group that did only the first 3 reps didn’t grow much. Even if they did the same 24 reps. They probably barely broke a sweat. On the other hand, the group that trained to failure, got a much better training stimulus. But what if volume and intensity are not fixed? In that case keeping one or two reps in the tank each set becomes superior because you can do more total effective reps in a workout. Let’s see why. Hypertrophy tends to increase with the number of sets performed. However, there are diminishing returns. After a certain point, called maximum recoverable volume, each increase actually has a negative effect.This was shown in a study by Gonzales-Badillo where three groups of weightlifters were put on different amounts of volume for 10 weeks. The first group did 1923 reps, the second group did 2481 reps and the third group did 3030 reps. All groups progressed in strength but the second group progressed the most. This suggests that progress has a linear relationship with volume but only up to a point. After that you start going backwards. There is an intensity threshold that we have to pass in order for reps to become effective. In other words, not all volume is equal, it needs to be heavy.For example a study by Brad Schoenfeld compared muscle and strength gains between two groups – a group that trained with light loads and did 25-35 reps per set and a high load group that did 8-12 reps per set. Both groups gained the same amount of muscle but it was much harder for the light load group. The guys were lifting baby weights for 30 reps but the first 20 were basically a warm-up, too light to do anything. Only the last few reps which were hard to do actually induced muscle growth. 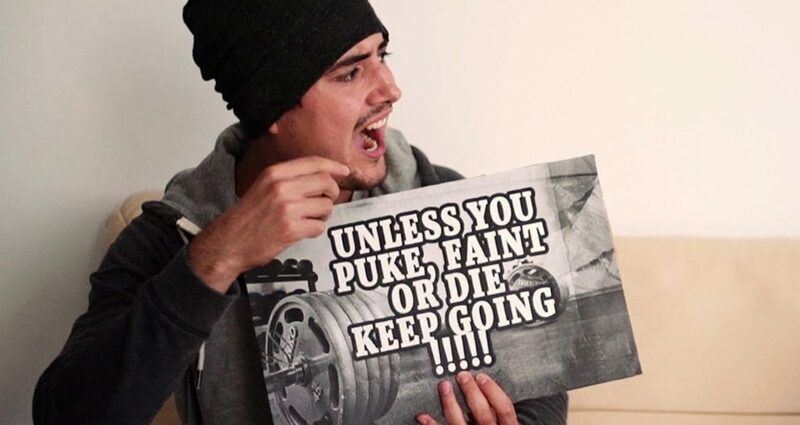 It’s better to spread your volume over multiple workouts instead of doing everything in one session.Rastaad and collegues found this studying the Norwegian powerlifting team. The powerlifters did the same amount of volume and intensity but with different frequencies. Half the team trained three times a week and the other half split each workout in two and trained six times per week. Strength and muscle gains were found to be better in the higher frequency group despite doing the exact same amount of work. So we know that the formula for muscle growth is to do a moderate amount of effective reps per week, preferably with a higher frequency. Training to failure works against that formula. First of all it reduces the amount of effective reps you can do in a workout. For example let’s say you do three sets with a load you can lift 10 times, your 10RM. If you go to failure in the first set, you will be very fatigued in your second set and probably only be able to do 7 reps with the same weight. If you go to failure again, in your third set you’ll be able to do only about 5 reps. So in total you get 22 reps that have the potential to stimulate growth. But if you stop at 9 reps in your first set, you will be able to do 9 reps again in your second set. Then in your third set you’ll be able to do 8 reps. So in total you get 26 reps that have the potential to stimulate growth. Probably, but only by a very small amount because you’re stopping just one rep shy of failure. Considering that hypertrophy goes hand in hand with the amount of effective volume you do, you will grow better that way. Not only that, but if you wanted to, you could add a fourth set to that exercise. This will increase the training stimulus even further. Another big disadvantage of training to failure is that it puts more stress on your body requiring a longer recovery time between workouts. Because of that your training frequency is reduced. You may have a heavy upper body workout on Monday and another upper body workout on Thursday. Training to failure on the first session will suppress force production for the second workout. This will negatively affect both the number of reps you can and how heavy you can train. And yet another disadvantage is that you will accumulate residual fatigue faster making you have to deload more often. So, instead of pumping out reps to failure it’s better to leave 1-2 reps in the tank at the end of your sets with all compound exercises. 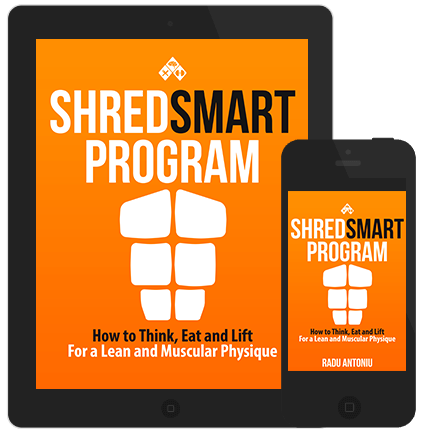 The ShredSmart Program shows you exactly what to do to get a low body fat percentage. The workout routines are designed based on the principles discussed in this post: accumulating enough heavy volume, managing recovery and training a body part twice a week. Check it out. You can get the first chapters for free. Around 11 pm, my stomach starts growling like a mad lion and it sometimes happens during a lecture and I find that really annoying. I usually eat from 12 pm to 20 pm and it’s not because I am extremely hungry during my last hours of fasting. I drink plenty of water and some coffee but it still happens. Any tips to keep my tummy in check during fasting? Check the post above. I miss-posted the comment . 1. You can choose when you want to feel hunger, by having your meals at those times. If you discover you’re always hungry on 4 meals a day while cutting, you could reduce your meal frequency to 2 or 3 meals a day. Now instead of feeling that real, physiological hunger 4 times a day you can reduce it to 2 or 3 times a day. This is one of the coolest things about Intermittent Fasting. Once ghrelin adapts to this eating pattern, you’ll only feel hunger in the second part of the day, at the times you’re going to have your meals. Ghrelin takes 1-2 weeks to adapt to a new eating pattern. 2. You shouldn’t eat or have snacks when you’re not hungry because those calories will contribute very little to the feeling of satiety. That’s because ghrelin will stimulate hunger at the time you usually eat, regardless if you already had a meal 2 hours before. For example I’m used to eating a big meal at 9PM. If I have the same meal at 7PM one day, guess what? Hunger will be triggered at 9PM anyway. Or if I have breakfast, I’ll be just as hungry at lunch as I usually am. Wow I’ve never heard this issue before. I don’t know if there’s other ways than eating to stop your stomach from growling. HIi Radu, Greetings from India. I have been following your youtube channel and the blog closely. Lost 5kg in one month…thanks and keep up the good work….. I noticed you have not mention Water Weight in any of your video. Could you please clarify about water weight and how to get rid of that…. I touched on water weight in this post, check it out. Cu bataie directa la poza din titlu : ce facem cand ni se face rau la sala dupa 5-10 minute de cardio si analizele is bune iar sub-alimentarea nu e cauza? with respect to the picture in the headline : what do we do when we almost pass out after 5-10 mins of cardio and sub nutrition or heart problems are not causes? If one is to not train to failure, how does one progress? Normally when I want to progress I force my self to push through to do additional reps, so how do I progress when not pushing myself past my previous reps from previous training session since Im avoiding failure? You increase the weight. It does not mean you will lift easy it’s just you lift with proper form, before you feel your next rep would go to fail. What do after you add the 4th set with low reps on your next workout? Do you attempt the failing weight next workout or you do the low reps more sets a few times before attempting that?